Mambilla Power Station is one of Africa's (and Nigeria's) biggest projected dam projects, which will be connected to three dams across the Donga River in Taraba State, Nigeria . It was first conceived in 1972. Attempts were made to revive the deal without success. But the deadlock was broken by conversations between the presidents of China and Nigeria in 2016, according to the spokesman of Nigerian President Muhammadu Buhari. With incessant attacks on gas pipelines and the continuous blackout due to over dependence on gas-based power stations, government pushed to go beyond the thermal generation and raise the hydropower capacity to the national grid. The meeting resulted in the creation of a consortium of Chinese companies to deliver the project, and an agreement that the Chinese government would commit finance to it. The federal government eventually signed the contract in November 2017 with China's Sinohydro Corp. and China Civil Engineering Construction Corporation (CCECC) to build the Mambilla Power Station. The Chinese Import-Export Bank will finance 85% of the development, with the Nigerian government contributing 15%. Completion of the project is expected in 2024, and it is expected to increase Nigeria's generating capacity considerably . Main justifications for the project include the frequent power blackouts the country suffers (despite being one of the largest economies in Africa, over 40% of Nigerians live without access to electricity, according to World Bank figures.) Second, hydropower, one of the cleanest and cheapest forms of power, is promoted as a key target for development as Nigeria is currently exploiting just a fraction of its potential resources. The country is also seeking to shift away from oil exports dependency, after plummeting oil prices triggered a recession. According to Hydroworld website, Minister of Power, Works, and Housing Babatunde Fashola SAN, said the project would, on completion, stabilize the national grid between the South and North of the country. “It will have considerable positive impact on electricity nationwide, productivity, employment, tourism, technology transfer, rural development, irrigation and food production in the area and beyond,” . In addition to Mambilla, Fashola called on the country last year to expedite development of three hydro projects: 700-MW Zungeru, 250-MW Gurara and 35-MW Dadin Kowa. Howerever, there are a number of concerns over the plant. First, the location of the development could lead to complications. The land affected by construction is under strong competition which regularly sees outbreaks of ethno-religious violence. Displacement could considerably worsen the conflict dynamics and humanitarian situation in the state. Environmental groups have also raised concerns about the potential impact. According to International Rivers, "If the Mambila dam project does continue, it could mean disastrous environmental and social impacts for those already living in poverty along the banks of the Benue River," Also, along the decades of planning of the Mambilla plant, instances of bribes and corruption have been registered and openly denounced by organizations such as International Rivers . Project Details The project which is expected to cost $5.79 billion would be funded by the Nigerian government and Chinese lenders through the China Exim Bank, on the ratio of 15 and 85 per cent respectively.The main Mambilla Dam (3,050MW installed) is a large rolled compact concrete dam and reservoir at 1,300 metres (4,300 ft) above sea level. From this dam water is diverted off the reservoir towards the western side of the plateau through 3 hydraulic tunnels totaling 33 kilometres (21 mi), intercepted by 2 smaller dams (Sum Sum Dam and Nghu Dam), both at an elevation of 1,250 metres (4,100 ft). Beyond these dams, the tunnels lead into a 1,000 metres (3,300 ft) drop shaft tunneled down through the rock to a massive underground powerhouse with a generating capacity of 3,050 megawatts (4,090,000 hp). Via a short tunnel, the water then exits the base of the plateau and flows into a tributary river that rejoins the Donga River downstream of the plateau. 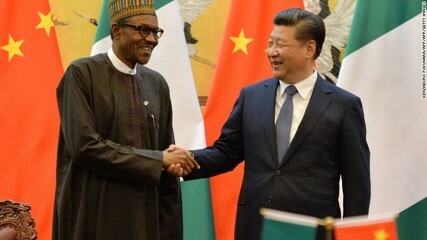 Nigerian President Muhammadu Buhari and Chinese President Xi Jinping Nigerian President Muhammadu Buhari and Chinese President Xi Jinping shake hands in Beijing, during the former's state visit in 2016.